One of this Grandma’s mantras is to create rituals and traditions with grandchildren because that is what they will remember from their childhoods, and we want them to remember us fondly always. See posts on creating rituals and traditions. * So, this Grandma and Grandpa buy each grandchild their Halloween costume each year and the picture of them in their costume goes into their annual photo album. Yes, you can use a caption acknowledging your purchase if you like. A second mantra is to honor the parents of the grandchildren, and Halloween is a holiday that may or may not be welcome in the homes of the parents of our grandchildren. If it is, then Grandma can go into action. This Grandma’s favorite Halloween costume for newborns and small babies is the peapod. I have written previous posts on costumes for baby and toddler grandchildren, and Halloween is the time to offer to buy a costume to put the baby in and let the parents pick it. Yes, you can make suggestions, but the parents select. Of course, it makes for a great picture. Of course, the baby and toddler will be in the costume for minutes. So, see the websites in the previous posts for ideas or try to gear them to Amazon. See post on finding costumes which includes the peapod. Also, if the parents of your grandchildren are into organic cotton, try Pottery Barn Kids which is more expensive but has sales. In 2015, this Grandma gave the five best tips for Halloween costumes, which still holds true. However, this Halloween, 2016, I decided to interview my grandchildren about their Halloween costume choice. After all, now it is a given that Grandma and Grandpa are buying their costumes. The parents seem to still enjoy this outing, and, fortunately a store like Party City is the choice, so each costume totals about $30. If the parents do not enjoy this outing, they might let you buy a costume with the grandchildren or on line. Amazon has the best selection and pricing. Yes, if you have many grandchildren, buying a Halloween costume annually might not be the best ritual or tradition to follow. However, once they hit preteen, they want to make their own, so it is not too long of an expense. When interviewed, the five year old was adorable, of course. He chose Ninja, but said it was a hard choice. He is into Pokemon, and he loved a Pikachu costume too. But, he said that he cannot wait to be a dad of a girl, because the girl Pikachu costume was the cutest, and he will get that when he is a dad. You can find a Pikachu costume on Amazon at varying prices. When interviewed and asked to also pick what he would get if he were a girl or the dad of a girl, the nine year old let out disgust. Of course, he could not even imagine picking a girl costume at his age. He picked a Harry Potter costume. This Grandma does not post pictures of grandchildren to protect their privacy, but the picture in this blog post is of this grandson. You can see why. He wanted to be as scary as he could be, and his mother said that she had to tone it down. Be forewarned. 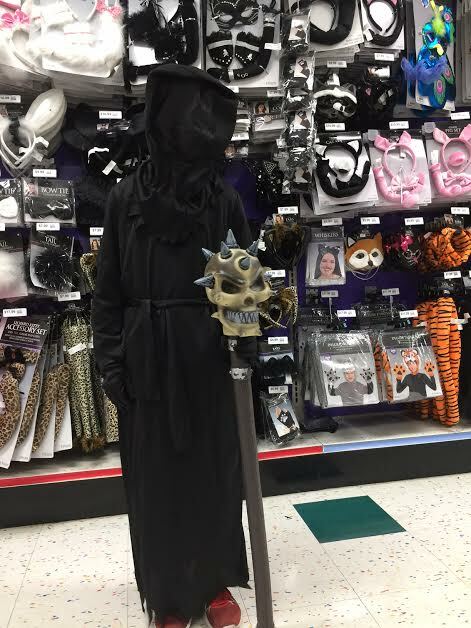 On Amazon, there seemed to be only one Dementor scary costume, and it was very reasonably priced. The others would not be of interest to our nine year old. Interviewing the older grandchildren got the results I anticipated. They are less and less interested in Halloween costumes, and only care about the candy. The ten year old had no idea what she wanted to be so we are going shopping on line together for a new costume. She does not want to wear her cat girl costume from last year. The near thirteen year old knew more about the girls and what they were doing than in previous years. He said they all wear matching, like all referee costumes they make. The boys, he said, either wear no costumes, or are silly. He said the rage this year is to flip water bottles. He agreed that this is silly. He is going to be a flipping water bottle. I forgot to ask which brand of water bottle he is going to be. Yes, this Grandma had to look on the internet to see if there is anything about water bottle flipping. It seems that this is the new rage, as my grandson said, and you too can hear the water bottle flipping song and watch the teen who did a talent contest on flipping a water bottle to land right side up. It seems we are “out of it” if we do not know about this. I do not jest. Watch on YouTube.